The BRICS leaders took a family photograph before the beginning of the meeting. Prime Minister Narendra Modi welcomed leaders at Restricted meeting saying that BRICS nations have been a voice for peace, reform, reason and purposeful action. Before the meeting of BRICS leaders, Prime Minister Modi held bilateral meetings with Bhutan Prime Minister Tshering Tobgay Sri Lankan President Maithripala Sirisena ahead of the BRICS-Bimstec Outreach Summit in Goa. 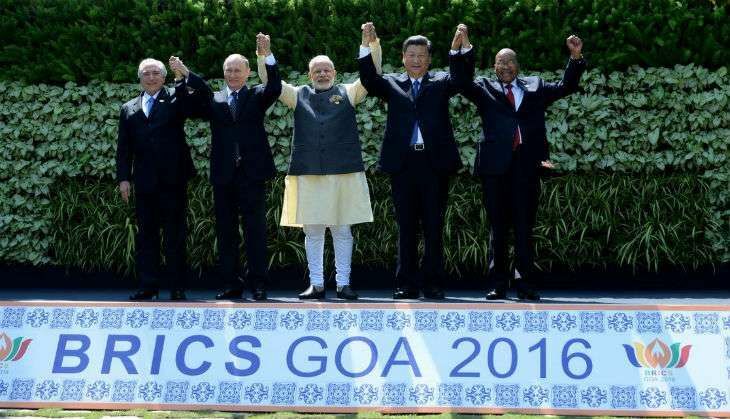 The Eighth BRICS Summit that kicked off with an informal dinner of leaders of Brazil, Russia, India, China and South Africa in Goa on 15 October; would resume on Sunday, where the leaders will look at global economy, political situation and the challenge posed by terror outfits. As many as 115 events have been planned for the summit, the theme of which is 'BRICS - Building Responsive, Inclusive and Collective Solutions'. The focus is on giving a fillip to people-to-people contact. The events include two parliamentary meetings, 15 ministerial-level meetings, 56 senior officials' meeting of working groups and expert groups, 27 workshops, three track-two events and five events along business pillars. Summit leaders will also look at BRICS cooperation with other emerging economies, issues of climate change, sustainable development goals (SDGs), financing for development and how to increase people-to-people contact. In this connection, India hosted the first ever tourism convention of all BRICS countries.